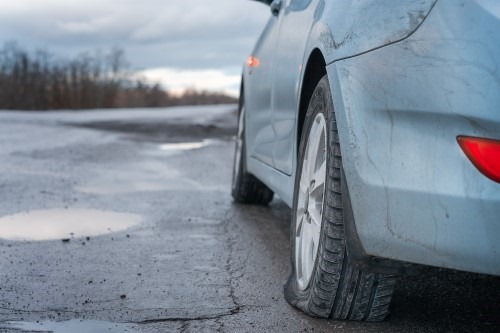 Having a flat tire or one blow out on you is stressful, and being stranded can be very frustrating. We totally get that and want you to know that we take each call very seriously. And will be en route to your position with a strong sense of urgency. Before you read down the page, please ensure you’re safely off the road and out of any danger of someone running into you. If not, try to pull into a well lit area with other people, especially if it’s dark or getting dark soon. If you feel unsafe leaving your vehicle, lock the doors and call us. We’ll dispatch a pro to you immediately. If you feel very unsafe, see if you gently drive down the road to a safer location. The cost of repairing your wheel is nothing compared to the value of your life. If you believe it’s necessary, please call the Sandy Springs Police Department at (770) 730-5600 and request an officer’s presence. Changing a tire can be a quick and straightforward process if you have the tools and the experience for it. If you’re not confident in your ability to do it correctly or aren’t mechanically incline. Please don’t take the chance on your first time. Putting your spare tire on wrong can actually cause it to come off while you’re driving down at higher speeds. And that can cause a serious accident resulting in someone’s injury or death. Our flat tire assistance pro’s can change a tire safely and properly in a matter of minutes, not hours, and you can relax knowing it’s on right. Plus, if this is your first time, you can watch them and learn how to do it right for next time if you want to start doing it yourself. Our flat tire service is fast, affordable, and convenient. Call us at 404-800-6501 (just click the number to call) and we’ll be right there. Years of experience and countless roadside services give later, our roadside assistance professionals are both eminently qualify and equip to handle any roadside problem. We understand that the circumstances are unfortunate and frustrating. And we’re here to get you back on track quickly and affordably. If you’ve been in a wreck, the most important thing is your health and your safety so please prioritize those. We take care of any kind of vehicular issue you’re having, whether it’s a flat tire or stuck in the mud. Minutes can turn into hours when you’re wreck, so don’t delay in calling us. The sooner we hear from you the sooner your experienced tow truck professional will get you back on the road.